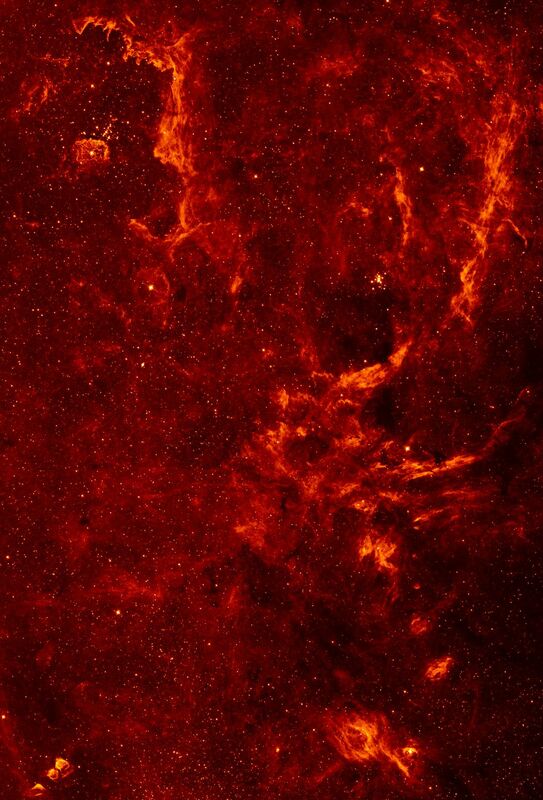 This NASA Hubble Space Telescope infrared mosaic image represents the sharpest survey of the Galactic Center to date. It reveals a new population of massive stars and new details in complex structures in the hot ionized gas swirling around the central 300 x 115 light-years. This sweeping infrared panorama offers a nearby laboratory for how massive stars form and influence their environment in the often violent nuclear regions of other galaxies. The infrared mosaic was taken with Hubble's Near Infrared Camera and Multi-Object Spectrometer (NICMOS). The Galactic core is obscured in visible light by intervening dust clouds, but infrared light penetrates the dust. The spatial resolution of this image corresponds to 0.025 light-years at the distance of the Galactic core of 26,000 light-years. Hubble reveals details in objects as small as 20 times the size of our own solar system. The new NICMOS data show the glow from ionized hydrogen gas as well as a multitude of stars. NICMOS shows a large number of these massive stars distributed throughout the region. A new finding is that astronomers now see that the massive stars are not confined to one of the three known clusters of massive stars in the Galactic Center, known as the Central cluster, the Arches cluster, and the Quintuplet cluster. These three clusters are easily seen as tight concentrations of bright, massive stars in the NICMOS image. The distributed stars may have formed in isolation, or they may have originated in clusters that have been disrupted by strong gravitational tidal forces. The winds and radiation from these stars form the complex structures seen in the core and in some cases they may be triggering new generations of stars. At upper left, large arcs of ionized gas are resolved into arrays of intriguingly organized linear filaments indicating a critical role of the influence of locally strong magnetic fields. The lower left region shows pillars of gas sculpted by winds from hot massive stars in the Quintuplet cluster. At the center of the image, ionized gas surrounding the supermassive black hole at the center of the galaxy is confined to a bright spiral embedded within a circum-nuclear dusty inner-tube-shaped torus. 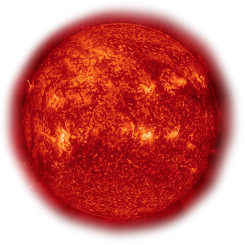 The false-color image was taken through a filter that reveals the glow of hot hydrogen in space.